Black fencing with new trees. I love the brick walkways-they sparkle. Islands of foliage and flowers. Kate Adams had no idea she was carrying counterfeit money and can't believe that it came from her sweet elderly neighbor. Or that it has landed her in the middle of another of Detective Tom Parker's investigations. Determined to prove her neighbor's innocence, Kate stumbles into a pit of intrigue far deeper than a two-bit counterfeit operation--and one that strikes too close to home for comfort. As family secrets come to light, her world--and her budding romance with Tom--begin to crumble. To Kate, it's clear that she won't be safe until she uncovers all of Port Aster's secrets. But then will it be too late for her and Tom? Kate Adams is in trouble again, and Detective Tom Parker wants to protect her. In Book 2 of the Port Aster Secrets series, Sandra Orchard sets the pace of this page turner in the first paragraph. As Kate struggles with accusations and the mystery that shrouds her father’s death, Tom works to catch counterfeiters. As the two become entwined in intrigue and secrecy, the story races to an intense end and leaves the reader anxious for book 3. 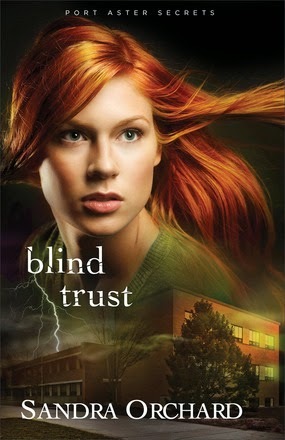 If you enjoy fast paced suspense with a bit of romance, you’ll enjoy Blind Trust. Thanks to the publisher for providing a complimentary copy of this book for the purpose of reviewing this book honestly. I'd love for you to follow my blog. Just sign up with email. Thank you! Share book reviews and ratings with Penny, and even join a book club on Goodreads.